From early wrapped objects to monumental outdoor projects such as Valley Curtain in Colorado (1970–72), Running Fence in California (1972–76), Surrounded Islands in Miami (1980–83), The Pont Neuf Wrapped in Paris (1975–85), The Umbrellas in Japan and California (1984–91), Wrapped Reichstag in Berlin (1972–95) or The Gates in New York’s Central Park (1979–2005), the artists have transcended the traditional bounds of painting, sculpture and architecture. Together they changed the concept of “public art” by creating temporary works that are truly transitory by design. 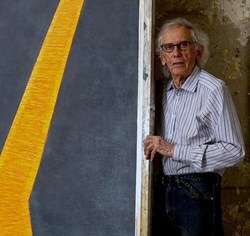 Jeanne-Claude passed away in November 2009, but Christo continues with his work on Over The River and The Mastaba. The original concept for his latest work in progress, The Floating Piers, was conceived together with Jeanne-Claude in 1970. In 2014, Christo found Lake Iseo to be the most inspiring location for the project, which will be on view from June 18 to July 3, 2016. The artists’ goal has always been to create works of art of joy and beauty, without charging any viewing fees. Christo and Jeanne-Claude have never accepted, nor will Christo accept in the future, any subsidies, royalties, grants, or sponsorships of any kind for their temporary public works of art. All of the artists’ income is derived from the sale of original works of art by Christo to private collectors, galleries and museums.